Roses have been among the most beautiful highlights of the Missouri Botanical Garden’s living collections for more than a century, but the rose plants currently on display in the Gladney Rose Garden and Lehmann Rose Garden are relatively new to Garden grounds. Between 2012 and 2013, every rose rose plant in the Garden had to be removed and replaced with a new plant. The culprit was a viral condition known as rose rosette. The virus is spread by a minuscule eriophyid mite, which can travel through wind and on clothing and equipment. The mites feed and reproduce on rose shoots, quickly spreading the virus from plant to plant as females can lay an egg per day for a month in newly developing shoots. Young mites only take three to four days to hatch and fully mature within a week. In addition to its rapid spread, the virus is also dangerous due to its symptoms mimicking herbicide damage in cultivated roses. Those rose varieties show thickened, succulent stems and a proliferation of thorns when infected. The symptoms are easier to spot on the host of eriophyid mites, the multiflora rose. In this plant, there is red pigmentation on the underside of leaves, increased vegetative shoot growth, deformed leaves, yellow mosaics appearing on leaves, and an increased amount of small leaves, short petioles and red shoots. 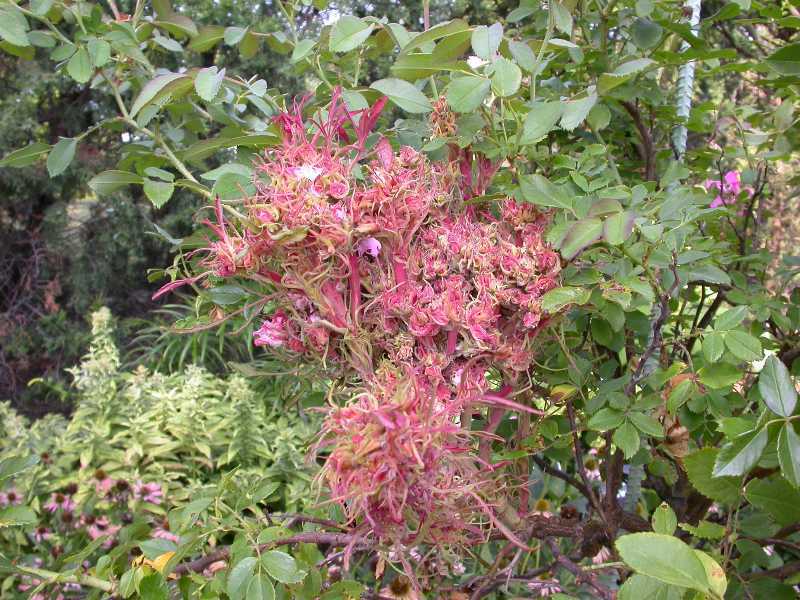 Tell-tale witches’-broom caused by rose rosette on a shrub rose. Transmission of the virus occur May to mid-July, with symptoms beginning to appear mid-July. Small plants die in two years, while larger plants may survive up to five years while infected with rose rosette. There is no cure for rose rosette. The only action that can be taken after infection is to remove the entire plant and destroy it either through burning or by placement in a plastic bag and disposal. If not caught early, the virus can devastate an entire garden of roses—including ours. “We’ve had to remove plants frequently since the initial infections appeared,” explains Marissa Sedmak, the Garden’s head rosarian. The lack of a cure means that any rose garden maintenance must include some form of integrated pest management.